Today is the day when we’re all showing people we love them, and that’s not limited to our personal relationships. It’s also a day to show customers, clients, members, supporters, and Facebook fans some extra love. Lots of businesses thank their customers with reward programs: loyal customers receive enticing deals, free goodies, or even cold, hard cash back. If you’re a small business, it may not be possible to offer these programs regularly. That’s why there’s nothing like an old-fashioned, straightforward “thank you” to make your customers feel appreciated, and your Facebook Page is the place to do it. It doesn’t even have to be Valentine’s Day. Your Facebook fans are some of your best customers. The customers who become fans or “Like” the content on your Page are interested in what you have to offer — and they’re likely your best customers and most engaged fans. These people already like you, and they love hearing that you appreciate them. Thanking them on social media is a simple way to reach them. It’s a personal conversation. Your Facebook Page has a unique tone that sets it apart from other interactions you have with your customers. You can be a little more laid back on your page, because social media in general is about casual interactions and connections. It’s a little less hard-sell, a little more personal. A “thank you” in this kind of space has a personal tone that may not be present in your other interactions, and people respond better to that. It’s easy for fans to share your message with their networks. Facebook is a terrific platform for sharing videos and images. This is the kind of content your fans like to share with their own networks — especially when it’s a feel-good message like a “thank you” from a brand they love. You’ll develop your relationship with your current customers, clients, and supporters, and attract new ones. You don’t have to wait for February 14 to show your fans some love. Thank them when they put in the time to give you feedback. Thank them when they recommend your business or organization to a friend. And be sure to just thank them every so often for trusting you with their business. 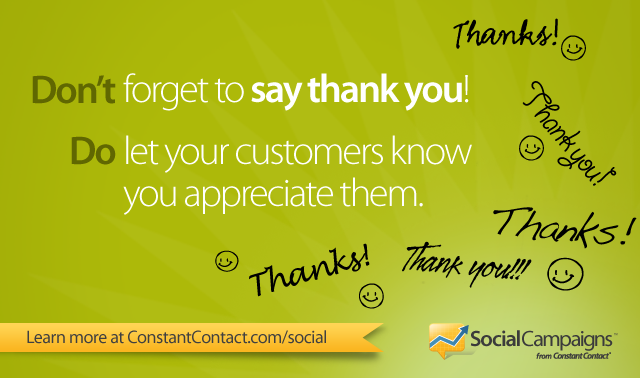 Customer appreciation should be part of conversations on your Page every day. Thank your customers and clients when they tell you they love your products and services, or the work that your organization does, and even when they’re a little critical. People respond positively when they feel acknowledged, and after all, knowing what your customers don’t love is just as valuable as knowing what they do. Create an image/take a picture. Just like videos, images are easy to upload onto your Page, and they give you the opportunity to get a little creative with your thanks. Add Helium, an underwater equipment company, recently created a Facebook campaign to let their customers know how much they appreciated their business. 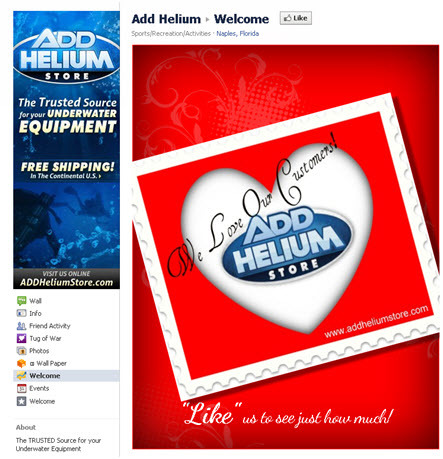 Add Helium branded their campaign and tied it into Valentine’s Day, making it timely. Plus, they added a great offer to sweeten the message a little more. Make a video. Videos are easy to upload onto Facebook, and nowadays, your smartphone or digital camera lets you create high quality video worthy of being seen by your audience. Plus, it’s a fun way to get your message across. Constant Contact has gone this route: Check out the thank you video we made for our customers last year. Thanking your customers, clients, and supporters is one of the best ways to show a little love, and help foster the kind of loyalty that keeps them coming back — and with your Facebook Page, it’s easy to reach them. How do you show your Facebook fans that you love them? We’d love it if you shared your thoughts with us in the comments section below.